"It's a great album! 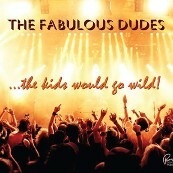 'The Fabulous Dudes' has great harmony; Bobby Nelson’s lead, 16 Candles tune and biographical lyrics all combine as a perfect match…super ending is a bonus! 'Our Winter Love' is haunting, beginning and throughout; and 'Christmas Time...' in every aspect is A-plus!!!" "I'm really enjoying the songs. All the new selections are great. We'll play the heck out of it on WSLR. All the best with it!" "I like what you are doing, and I want to start my own group. I'm young, 21, so I guess I have time. These are all great! On the title track of the album...how did you get it to sound so, well, '50s? Davilee: wow! That would have been a huge hit in NY/NJ if it was released then." "There are some excellent songs here. 'Our Winter Love' is fantastic. Two more good ones: 'Davilee' and 'A Boy Like Me.'" "The CD is always in my car. It's my calming-down music after a day at the office!" It’s hard to remember that there is still good in the world which one can find if one looks for it, and that life doesn’t have to be a zero-sum game. Perhaps our view is colored by friends and family passing, other friends moving, and so on. But my wife decorated our Christmas tree, we lit our menorah, we have great friends here and around the country and world, we try to focus on doing things rather than amassing stuff, and we are doing our best to stay optimistic. Good friends and good adventures go a long way to make that happen. And making what we hope is good music helps it all go down more smoothly! Thank you all.